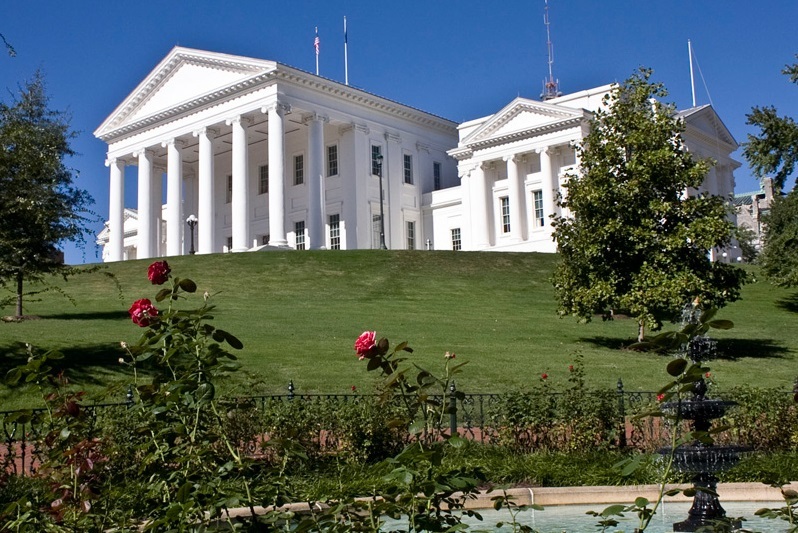 Virginia became a state June 25, 1788, the 10th state admitted to the Union. In 1780 Richmond was named capital of Virginia. However, at that time Virginia extended all the way to the Mississippi River. The borders of the state changed in later years. The Virginia capitol doesn’t have a dome. It looks more like a Roman temple, with beautiful columns. It overlooks the James River and was designed by Thomas Jefferson. Inside is a statue of Robert E. Lee, placed where he stood when he decided to lead the troops of the Confederacy rather than the Union during the Civil War. Nearby is Colonial Williamsburg, Historic Jamestown, and Yorktown, site of the last battle of the Revolutionary War. It’s not far to Washington, DC. The atmosphere of colonial times; the houses side by side by side; the gorgeous capitol with the Thomas Jefferson touch; the monuments and trails of history at every corner of every tree-lined street; Patrick Henry in costume and wig; Give Me Liberty! Mountains near: Appalachian Mountains. Mount Rogers in the southwestern tip of the state is the highest point in Virginia at 5,729 feet.